In Louisiana, club work was promoted by one of the earliest known instances of the use of motion pictures. In Baton Rouge, the enterprising E. S. Richardson, who had succeeded V. L. Roy as state club leader, braved the office of Thomas D. Boyd, president of Louisiana State, with an idea. 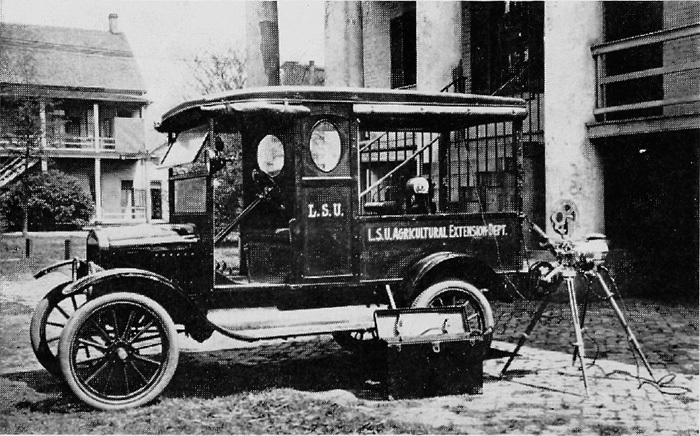 At that time – 1914 – there were few gas buggies in Baton Rouge. President Boyd had recently taken a trip by auto to Shreveport, and the journey, interrupted by tire changes and mechanical troubles, had taken three days. As a result, the president took a dim view of the future of the automobile age. To the president, Richardson proposed a novel and untried scheme involving extensive use of an auto. He wanted to rig a generator to the engine of a flivver. The generator would provide current to operate a motion picture machine and lantern slide projector. With this outfit, plus a couple of shovels to dig the car out of the mud, he proposed to travel the gravel and gumbo roads of the state, bringing pictures of club work to one-room schools. Much to his surprise, the president gave his assent, no doubt with certain mental reservations. Richardson bought his car, dynamo, and projection equipment. With the help of Dean W. T. Atkinson of the college of engineering, he perfected the device, adding that marvel of modern inventions, an electric stove, with which to give cooking demonstrations in the schools. Bravely the visual-education automobile set out on its journey with a young photographer named Jasper Ewing at the wheel. Arriving at a country school, Ewing and Richardson, with the help of the local teacher and eager students – many of whom had never seen a motion picture – took the dynamo from the car and staked it firmly to the ground with long metal pins. They jacked up the rear wheels and slung a belt drive between generator pulley and axe. This is one of the first-known visual education trucks. It was used in Louisiana to bring the story of club work to rural schools. The Model T engine ran a dynamo that generated current for the movie machine. This photograph appeared on page 130 of “The 4-H Story” by Franklin Reck. Meanwhile, inside the school, others were hanging heavy curtains over the windows to keep out the light. Ewing then set up his movie projector and screen, and presently the hushed and awed youngsters were seeing with their own eyes the miracle of motion pictures. As for results: “During the first seven months of 1915, the Junior Extension Service of the Louisiana State University visited 140 schools in 17 parishes and rendered programs with autostereopticon and moving picture machine to an estimated attendance of 23,340 school children, school patrons, and farmers. In addition to educational movies, there were shown at each school stereopticon slides depicting the various phases of corn, pig, poultry and canning club work. This entry was posted in History and tagged Early Motion Pictures by Larry Krug. Bookmark the permalink.